The app wasnt even on my phone until 3 days ago , I was charged 160$ and then the order was cancelled but the money has not been sent back to me , I have called wish over 6 times and i have not spoke with anyone I am very up set and I would like my money back. September 12, 2018 Trying to get an address to send a product back and cannot find anyone to talk to as everything on the site is automated. Download the private Firefox browser. It immediately erases your history when you close it and it's great at blocking malicious links. 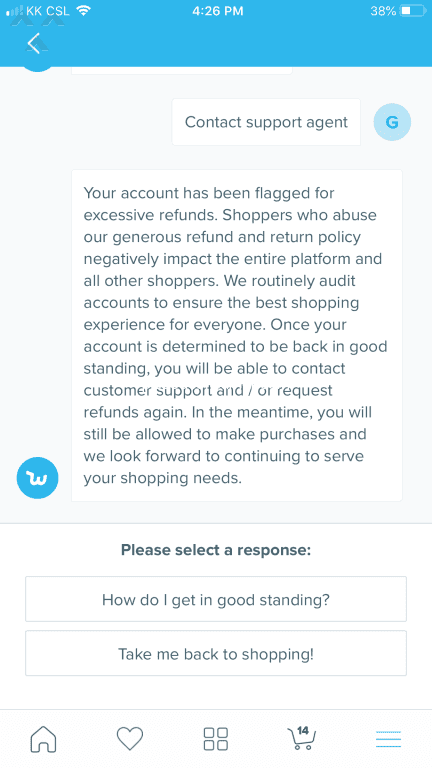 Told me to go to the customer support section of the wish app. The app provides a number that 'cannot be recognised'. Therefore there is no apparant way for me to track my packages or recieve my refund.